Proctor, John. North Lees Hall. 2006. One of the two homes thought to be the basis for Thornfield Hall in Charlotte Bronte's Jane Eyre. Creative Commons via Wikimedia Commons. From unloved, penniless orphan to treasured, upper class wife, the story of Jane in Charlotte Brontë’s Jane Eyre is one of development and personal growth. When published, Charlotte Brontë took a male pseudonym in order to avoid prejudices based on gender (Guy). While speculation on the identity of the author was a factor in the popularity of Jane Eyre, the story of Jane’s character kept the audience reading. As a novel in the bildungsroman genre, the narrative carries readers through the development of Jane and her “healthy self-interest and rebellious questioning of rules and conventions” (Watkins). Readers are introduced to Jane when she is a young girl living in the manor known as Gateshead. As an orphan, Jane is isolated and unloved by the Reeds, the family of the house. The lack of compassion for Jane is evident when she is locked in the “Red Room,” a haunting chamber where the last of Jane’s known blood relatives died. Mrs. Reed’s harsh punishment of Jane and the cruelty the orphan faces from the other children of the house leave Jane without a sense of belonging. Early in the story, Jane’s questions of belonging connect the novel to the bildungsroman genre. Jane’s desire for a better life is seemingly fulfilled when she learns she will be leaving Gateshead for the Lowood School. However, a cruel and abusive headmaster leaves Jane wondering if her situation will ever truly change. Fortunately, a fellow student named Helen Burns befriends Jane. Her deep religious beliefs and ability to suppress anger show Jane a new way to view her situation. Through her friendship with Helen, Jane is exposed to an alternative point of view that helps her grow emotionally and mentally. Helen’s death comes as a result of poor living conditions at the school, a situation similar to the death of Charlotte Brontë’s sisters, Maria and Elizabeth (Homans). Experiencing the death of a friend at such a young age forces Jane into a very adult situation early in life. Once again, the placement of a child or childlike character in an adult situation emphasizes Jane Eyre as a coming of age story. Jane’s development continues throughout her time at Lowood as she transitions from a pupil to an instructor. However, Jane soon finds her position unfulfilling; her longing for something more drives her to a governess position at Thornfield manor. During the Victorian era in which the novel was written, the position of governess was one of the only occupations available to women. In fact, Charlotte Brontë worked as a governess from 1839 to 1841. Brontë hated being a governess because she felt like an “inferior who was not ‘considered as a living and rational being except as connected with the wearisome duties she has to fulfill’” (Homans). Contrary to Brontë’s experience, Jane is described as excited and anxious at the new prospect of the occupation. At Thornfield, Jane teaches a French girl named Adèle. Abandoned by her mother and cared for by Mr. Rochester, the owner of Thornfield, Adèle is essentially an orphan like Jane. Luckily for Adèle, she has been loved and cared for while at Thornfield. Mr. Rochester intrigues Jane, eventually becoming a love interest. This romantic interest is realized by Jane and by readers through the appearance of Blanche Ingram. As an attractive, upper class woman, Jane becomes convinced that Rochester will soon marry Blanche. The comparison in the novel of Jane and Blanche points out the class differences essential to social norms of the Victorian era. Jane’s jealousy of Blanche and romantic interest in Mr. Rochester displays the evolution of Jane from a child to a woman who longs for more than familial love. When Rochester proposes to Jane instead of Blanche, she accepts. Hatton, Gordon. Norton Conyers House. 2007. One of the two homes thought to be the basis for Thornfield Hall in Charlotte Bronte's Jane Eyre. Creative Commons via Wikimedia Commons. Following the theme of difficulty throughout Jane’s life, the wedding ceremony does not go according to plan. It is revealed that Rochester is already married to a woman, as he later explains, who is mentally insane and who has been locked in the attic at Thornfield the entire time Jane has been governess. As a result of this new information, Jane rejects Rochester’s proposal to move away and get married. Instead, she abandons the love she has always longed for to preserve her self-respect. 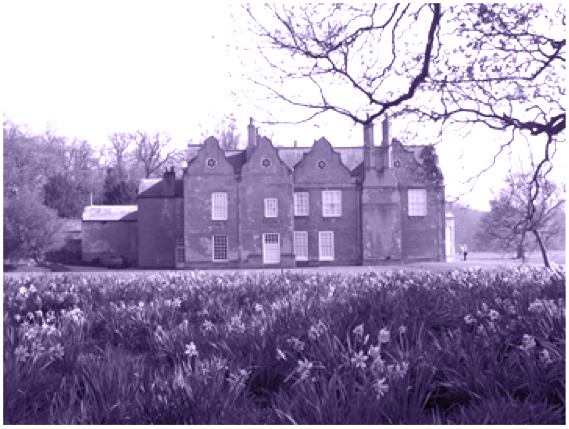 Leaving Thornfield opens the next chapter of Jane’s life. After fleeing from Thornfield, Jane once again finds herself penniless and alone. Jane nearly circles back to having nothing and knowing nobody. Again, the difficulty of life for characters in bildungsroman genre novels applies to Jane. Luckily, the Rivers family takes her in and provides her with much more than the necessities. When St. John, the head of the Rivers household, notifies Jane of an inheritance, it is revealed that the Rivers are cousins of Jane. By finally connecting with family, Jane finds a sense of belonging. Yet despite St. John’s proposal of marriage and life with him as a missionary in India, Jane decides to return to Thornfield. Upon her return, Jane finds Thornfield burned to the ground. It is later explained that Rochester’s wife set fire to the manor and jumped to her death. Finding Mr. Rochester blind and injured in his new home, Ferndean, Jane rekindles the relationship. As a consequence, the infamous line “Reader, I married him” draws the novel toward closure. Jane then joyfully describes her life with a partially blind Edward Rochester and a son. Jane Eyre is a coming-of-age story that was rebellious for the Victorian era. Throughout the novel, “the progress of Jane Eyre can be charted through a sequential arrangement of the family/counter-family dyad” (Spivak). Her development and growth throughout the novel is emphasized by her beginning as a lonely, penniless orphan to her solidified place in society as an heiress with her own family. Through self-reliance, questioning of her surroundings, and her healthy self-respect, Jane blossoms despite her orphan status. In the end, it is Jane who creates her own family and happiness. Guy, Josephine. "Authors and Authorship." The Cambridge Companion to English Literature, 1830-1914. New York: n.p., 2010. 8-29. Literature Online. Web. 3 Feb. 2013. Hattons, Gordon. Norton Conyers House. Digital image. Norton Conyers House. Wikimedia Commons, 8 Apr. 2007. Web. 3 Feb. 2013. Homans, Margaret. "The Brontes." The Oxford Encyclopedia of British Literature. N.p. : Oxford UP, n.d. Oxford Reference Online. Web. 3 Feb. 2013. Spivak, Gayatri C. “Three Women’s Texts and a Critique of Imperialism.” Critical Inquiry: 12.1 243–261. The University Press of Chicago. JStor. Web <http://www.jstor.org/stable/1343469>. Watkins, Susan. "Jane Eyre by Charlotte Brontë (1847)." Encyclopedia of the Novel. Fitzroy Dearborn Publishers, n.d. Web. 3 Feb. 2013.